It’ was one of the biggest surprises when I came across while writing the biography of Michele Pane: his grandson – or better, a nephew of his wife Arlene Baker – was and still is a very famous singer in the U.S.. Few in Calabria know her and is for this reason that I want to talk about in this blog. But let's start with order. 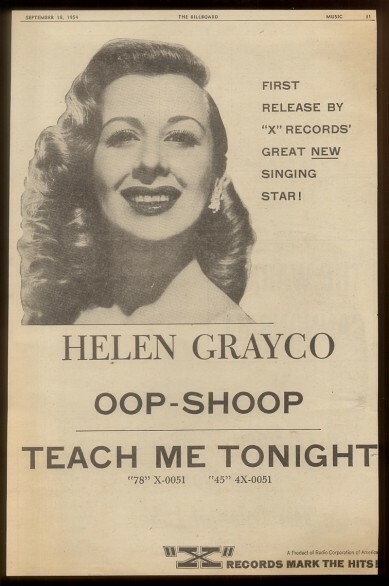 The singer is known as Helen Grayco but his real last name is Greco and its link with Concettina Bilotta is explained in the following lines. Antonio Sinopoli was the maternal grandfather of Maria Concetta Bilotta; among the sons of Antonio Sinopoli there were Innocent and Elizabeth. Elizabeth is the mother of Maria Concetta Innocence and married Greco Giovanbattista. By Giovanbattista was born in 1885 Baptist who emigrated very young in 1901 in the United States. Baptist Greco was thus first cousin of Maria Concetta but also second cousin of the same Michele Pane. The family lived at no. 1314 by South Cushman Ave. and its components are listed starting with the number 57 Sheet. The first is the head of the Baptist, following his wife Rosa, then the daughters Catherine, John, Theresa, Ralph, George, Anthony, James, Helen, Elizabeth, then his father-in-law Raffaele (Ralph) Cianflone. Battista is owner of a pastry shop where they worked the first two children, while the penultimate daughter is just the Helen which is discussed. Helen was born 20 settembre 1924 and she showed a remarkable talent for singing. At age eight he made his debut in a program entitled The Carnival Hour KHJ radio station that broadcast from Los Angeles. 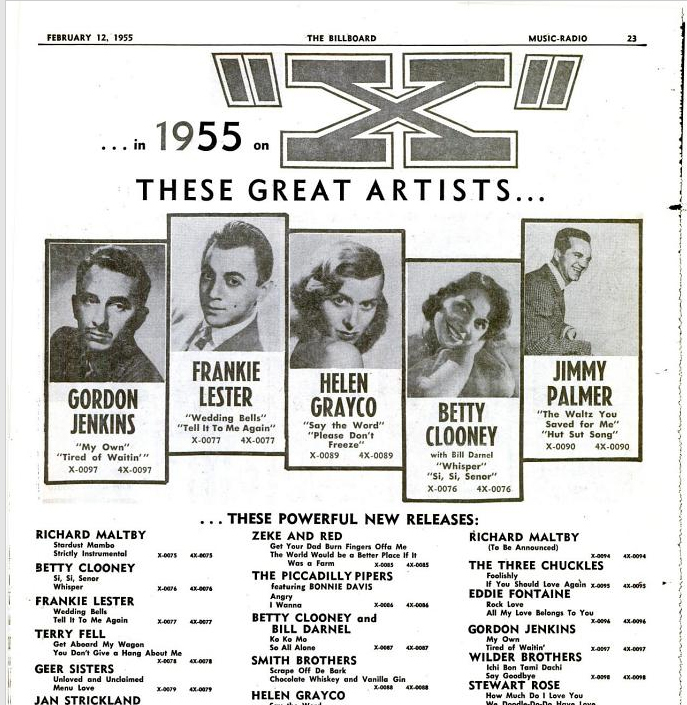 Then there was the meeting with Bing Crosby (famous actor and singer, He was also born in Tacoma) which happened to listen to Helen who sang in a radio show broadcast from a radio station in Seattle. Crosby, listening, uttered the prophetic words “Holly-wood!” and so it was. In those years – the 30 's – America was in the midst of the economic crisis, the great depression, and even Baptist's business, Helen's father, I suffered. Indeed, because of the great depression, It happened that the customers of his shop-restaurant could no longer pay the Bills and he, continuing to do credit, quickly found itself in an economic situation untenable and had to close the business. That's how Helen became the support for the whole family, its 10 Brothers, his parents and his maternal grandfather who lived with them. 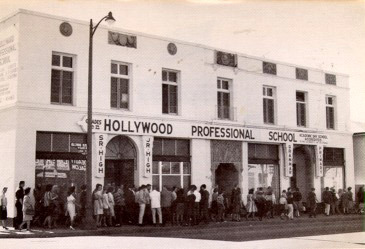 Accompanied by two older brothers and sister went to Hollywood where he managed to get the contract for the show. At that point the entire family moved to Los Angeles. Helen worked 50 up to 70 dollars per week, a major figure during the depression years. A 13 He was placed under contract by Universal Studios, signing a contract with Joe Pasternak. Universal Studios were looking for a new actress to replace Deanna Durbin, He had a huge hit with the film Three Smart girls del 1936, which was about to leave the young roles to move to those of female. Helen seemed a candidate to be the actress of Studios for teenage roles and pre-contract that included weekly pay of 100 He was dollar proof. 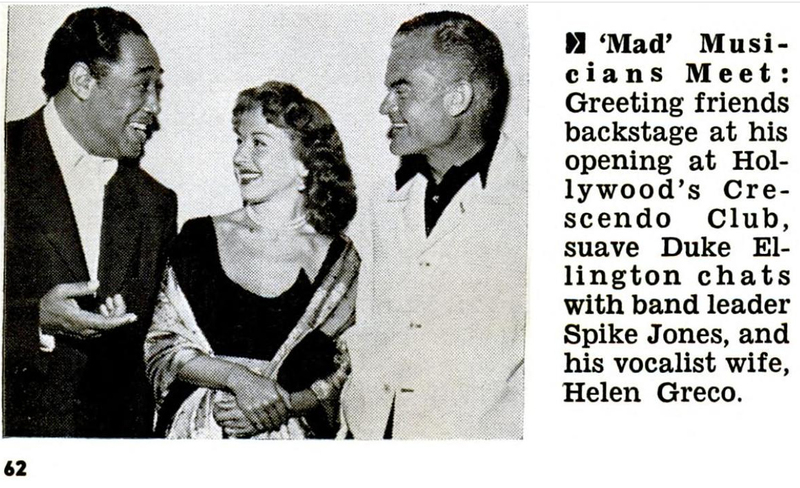 The film was supposed to call Little Lady directed by Norman Taurog, but a sudden change in the management of the Universal Studios, reversed things and Helen was dissolved. After Helen had some participation in famous movies, but these were small parts. His name, Of course, does not appear in the cast and the knowledge of this particular comes from an interview by the same American music critic Helen Bill Reed 2008. Meanwhile Helen attending Hollywood Professional School in Los Angeles. 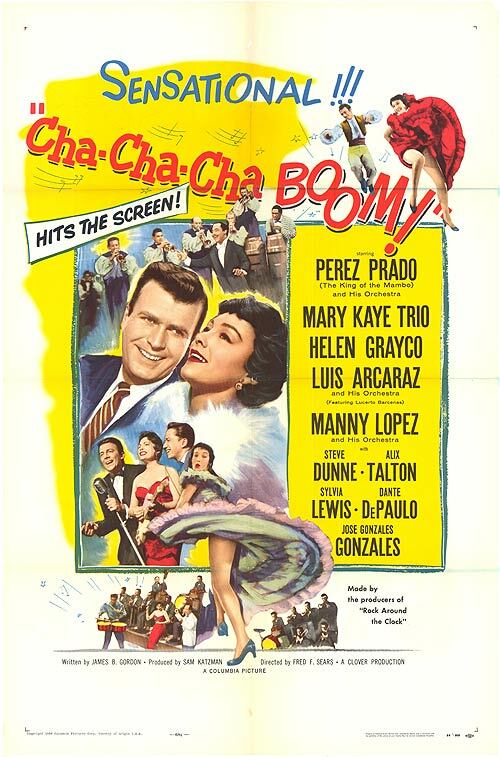 For two or three years Helen Grayco, This had become his stage name, He worked with the bands of Chuck Cascalas, Chuck Cabot and Red Nichols. 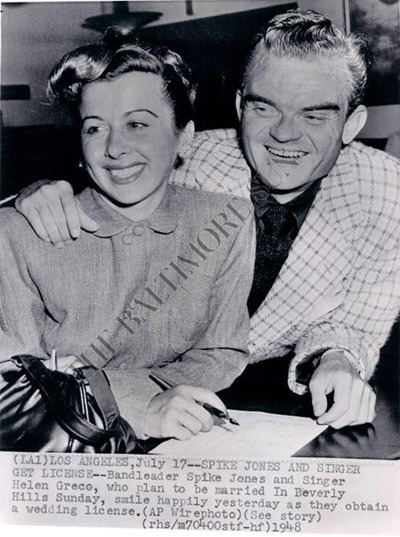 Nel 1946 the decisive encounter with her future husband, Spike Jones singer. 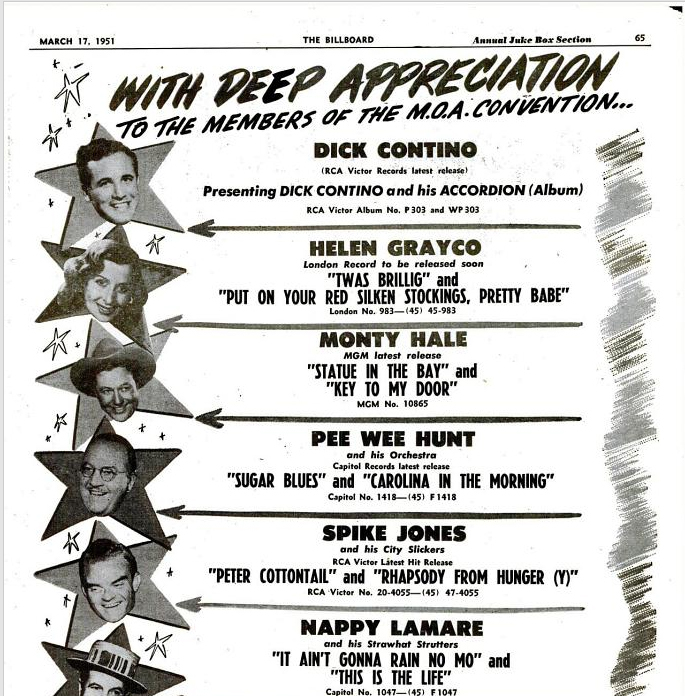 Helen was performing all’ Hollywood Palladium When it was felt by Spike Jones who waited for the end of the exhibition to talk with Helen to propose to work with him. Helen was puzzled why the kind of spectacle of Jones was completely different from his. 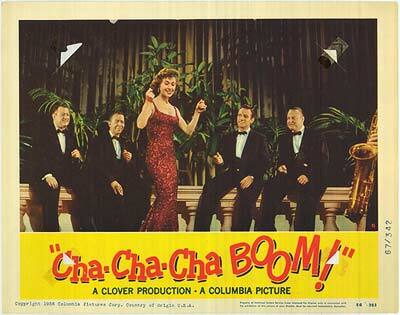 She was a singer of swing and jazz whilst Spike Jones proposed theater, best suited to actors that for singers. But he made it clear: Helen would have a space all its own, autonomous from the rest of the show, 15-20 minutes of useful songs to calm the public and usually very excited for the incredible performance of Jones. 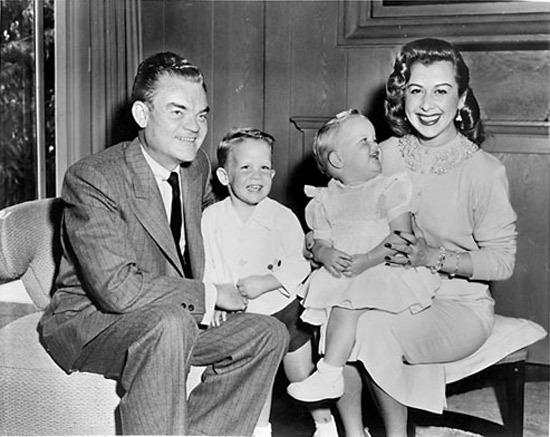 Helen is then inserted into the show by Jones and the two become something more that will take them to marriage in 1948. 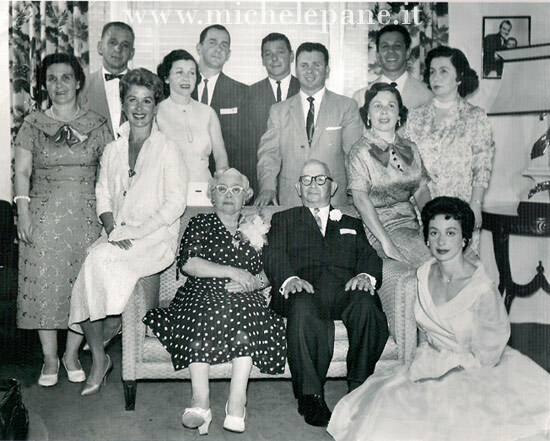 In that summer of 1948 they had gone in Los Angeles Maria Concetta Baker and his daughter Leda (wife and daughter of Michele Pane) as a story in the biography of Michele Pane on page. 214 and following. The couple were on honeymoon in Honolulu and returned to town just in time to greet guests who were to return to Chicago. 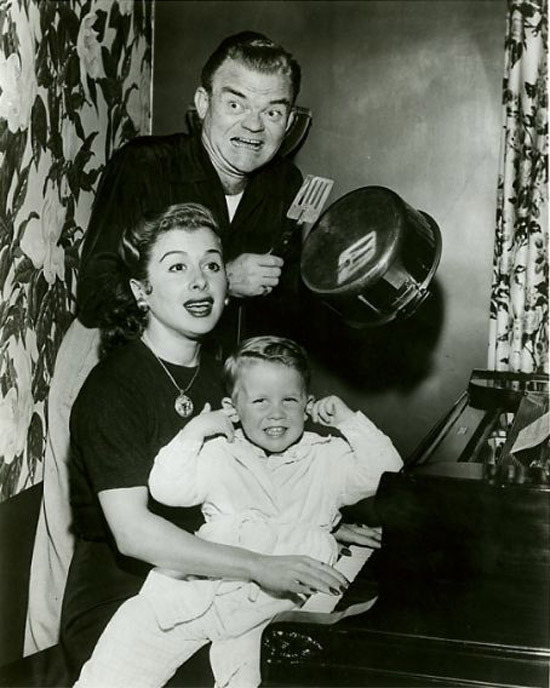 Spike Jones died at the age of 53 years in 1965. Helen maintained good relations with the family of Michael Pane. Besides the episode recounted in the biography Michele Pane. The Life in pag. 214, When the show ended down from the stage to greet the Bread sitting in the third row of Studebaker Theatre of Chicago (nel 1947), Pamela, the daughter of Salvatore, I wrote that he still remembers the day when, during a Spike and Helen from Chicago (in the early 60 's), She was a guest along with his father of the spouses Jones in restaurant Pump's Room. The Pump's Room of’Ambassador East Hotel It was the city's most prestigious restaurant, especially the One Booth, where was the major actors and celebrities. It was really something out of the ordinary be admitted in that Hall and Spike and Helen did a really nice gift by inviting Salvatore and daughter Pamela in that exclusive venue. In this exceptional creative parents are central to, seduti, and all about the children. Helen is left white suit, with its unmistakable smile. 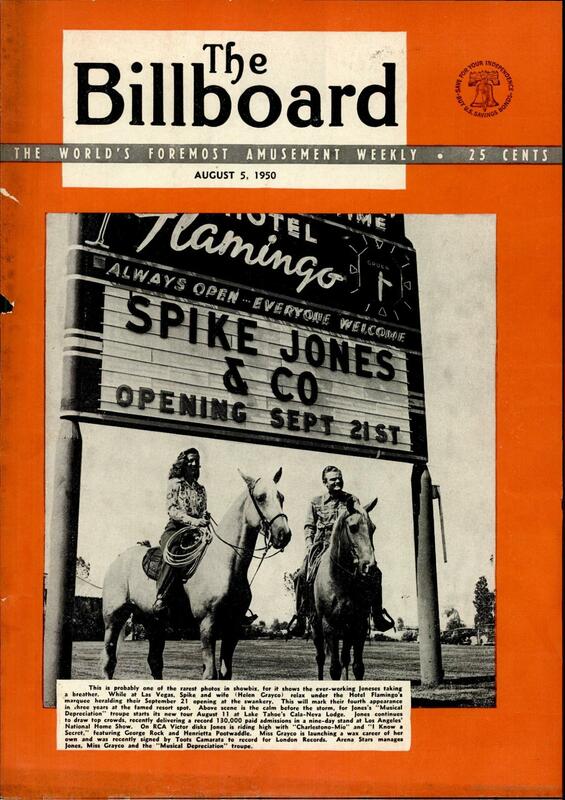 Hanging on the wall, right, You can see a frame with a picture of Spike Jones and Helen. Thanks again, Carmela, for their generous collaboration! Here's some footage that allow us to see Helen Grayco, a very talented artist. 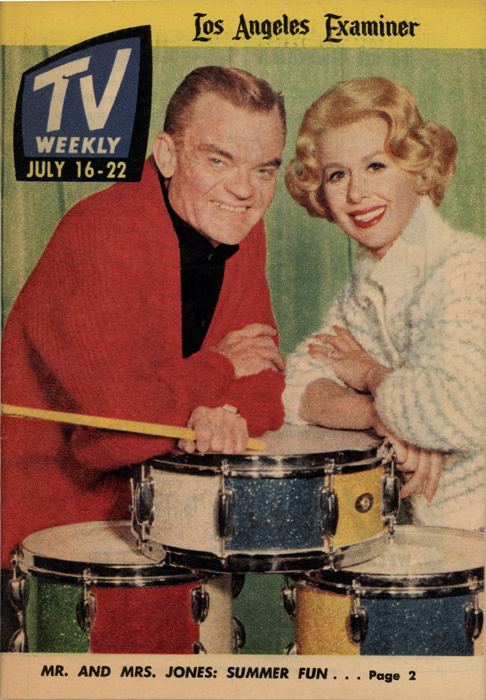 The first proposes one of the numerous holdings of Helen Grayco the spectacle that Spike Jones kept on NBC television network entitled Colgate Comedy hour. It was a program sponsored by Colgate Palmolive Company that alternated commercials of the multinational cleaning products then also famous in Italy with gags and songs and that aired Sunday evening 20,00 at 21,00. 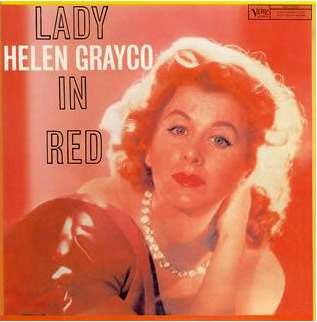 Helen Grayco also has investments in some Hollywood movies. 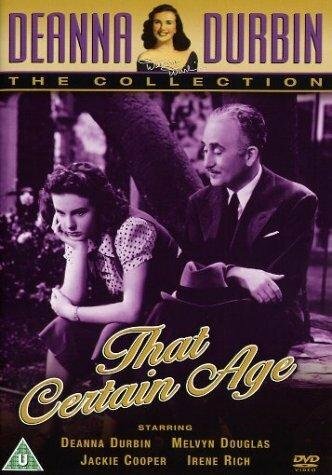 In this movie, starring Deanna Durbin, Helen has only a small part so that the cast is shown as “girl”. Helen in this film plays “herself” as it plays the track Lily's Lament [Cell 29] with music by Perez Prado that is visible in the previous link. 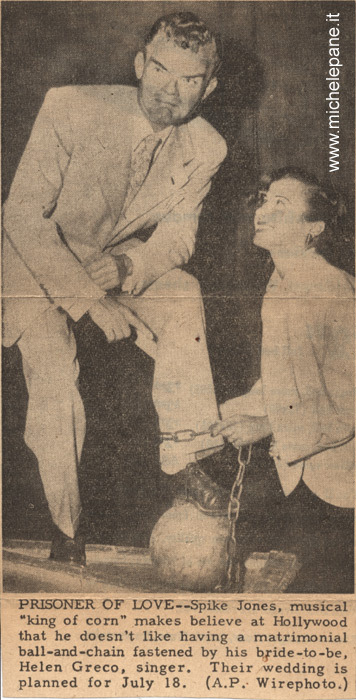 Helen Grayco Spike Jones and her husband were always followed with great attention by American newspapers that specialize in music. 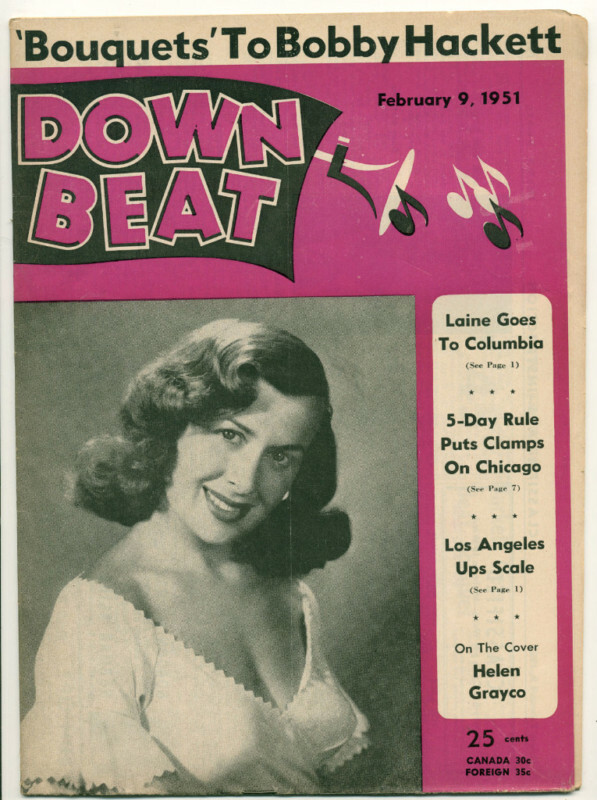 For example, the weekly The Billboard on almost all issues published news and photographs of the two artists, and often devoted their cover art. 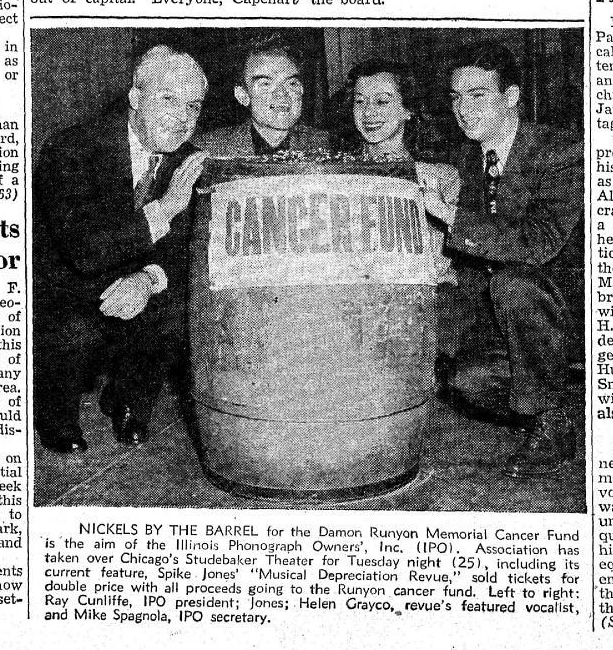 What follows is a photograph taken from an article published in The Billboard del 29 novembre 1947 When Helen and Spike (not yet married) show a barrel full of coins collected to finance a partnership for action against cancer. Photography is interesting because, as the caption says, the collection was made during a show at Chicago's Studebaker that then is when it came to the meeting with the family of Michael Pane (see Michele Pane. The Life in pag. 214). The tribute to Domenico Dara to Michele Pane. Novoli 2015: in anticipation of Focara we celebrate the "Festival of vines"!